I got the most beautiful postcard in the mail yesterday. An on-line friend (and totally amazing person) Dawn, had been going on a quick trip to England and Scotland with her husband Bobby. She always asks if people want postcards, and she is totally serious. I have gotten beauties from her vacations in the past. I asked for a postcard with a castle (I know there are a lot of castles in Scotland) and the card she sent me had three! And they are all fantastically beautiful! It made me smile all day. This lovely picture of Edinburgh Castle is similar to one of the three images on my postcard. Pretty kewl, huh? I also got a marvelous hand-made Easter card from my friend Poo in San Jose, California. My bad that I didn't acknowledge this sooner, but it was a truly lovely and very intricate raised embossed stamp and I just loved it. I know she reads my blog, so (waving and sending kisses towards the west) "Thanks, Poo!". 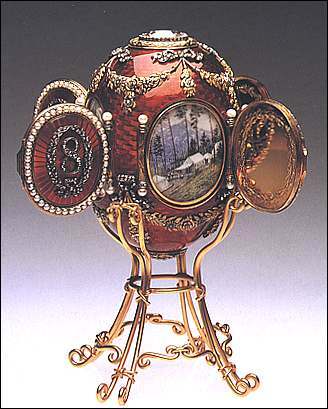 This isn't the stamp I got, but who can resist a Faberge egg? Isn't it amazing what positive effects a few minutes of kindness can generate? These small things - two pieces of mail from two friends, one who I've known for years, the other who is relatively recent and never met in person - brightened my outlook on life and put a smile on my face. Is there something that you can do today that will allow a smile and a kind thought about you to be carried through the day? Try to send positive thoughts and actions today. The world has so much negativity, don't add to that black pool. Rise above it and prove that Love can indeed move mountains. Have a great Friday! Current Location: Errands, but happy nonetheless. Thank you for your positive, lovely posts and pictures. Hugs to your wonderful Pip doggie. 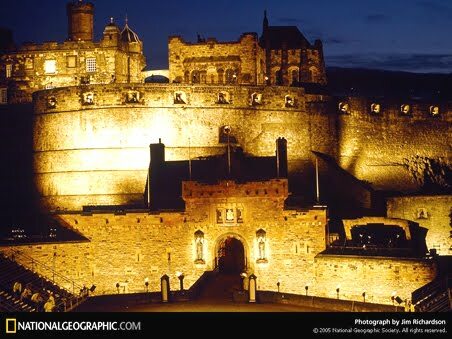 I have been to Edinburgh castle - I would like to go again without my ex who whined all the time we were there. I would love to see it, and I think my DH would enjoy it also. One of these days I'll find out - LOL. Awesome! I love the keep you chose, and York - how absolutely perfect! Eee, Scotland and England. ♥ The castle over there are amazing - I visited quite a few when I was over, several years ago. Isn't it amazing what positive effects a few minutes of kindness can generate? It really is. I wish more people would remember that. I made it all over England and Cornwall during my past two trips to the UK, but never made it to either Scotland or Ireland. Now I'm in a mood to do Florence and Barcelona, so I'm not sire if/when I might make it back to the UK again. I sure have OL friends that I would love to meet in RL though.